This 1-acre lot is at the valley, with a clear stream running across the land. Perfect for rearing fish. Choose between 1-6 acres and either valley or mountain top like the one on the right. 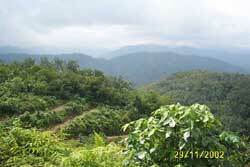 This is another 1-acre lot on top of the hill, offering a panoramic view of the surrounding. You can choose to buy 1-acre, 2-acres or 3-acres lot. This 1st photo shows the entrance which is opposite a housing estate and is only around 3.5 km from Bentong town. 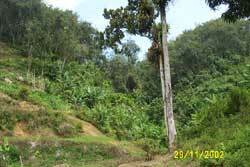 The 2nd photo shows the laterite road which is 1.3 km long leading to the above subject property. The 3rd photo here shows a fish pond owned by the front lot owner. The water is derived from the valley of the subject property as shown above.